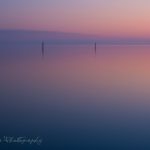 Algiers Point - A quiet haven minutes away from New Orleans The misadventures of a restless photographer. Travel photographer and travel blogger, Tracie Howe, wanders the globe seeking out new adventures and photo opportunities to blog about. Join her for a unique perspective on travel, travel photography, and travel tips. Algiers Point seems like a world away from the thriving heart of New Orleans, but it’s really only a 10 minute ferry ride across the Mississippi. 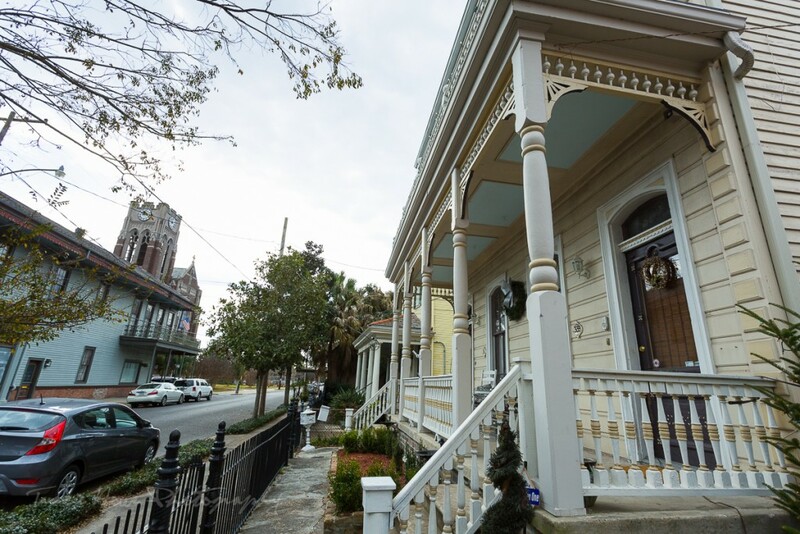 Algiers Point has been preserved as the second oldest neighborhood in New Orleans, evident in the beautiful and detailed architecture seen in houses lining the streets, some dating back to the 1840s. 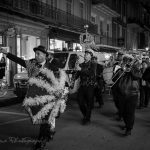 The historic homes, church bells, and small town atmosphere make Algiers such a charming neighborhood to visit, or in our case stay, during a trip to New Orleans. 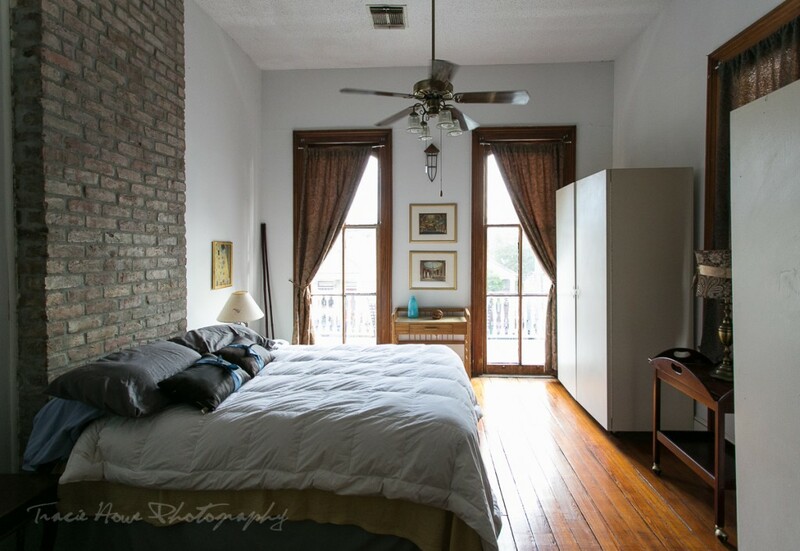 We were happy to have found a very reasonably priced Airbnb rental at The Old Captain’s House in Algiers Point. The place itself was as lovely and charming as the neighborhood, a historic Victorian manor complete with wide porches and rocking chairs. Upon arrival, our hosts generously offered to upgrade us to the private upstairs suite which included a full kitchen and bathroom (not listed in the link above) at no extra cost. This suite had a lovely balcony that overlooked the quiet street below and the little Catholic church that sat on the corner. 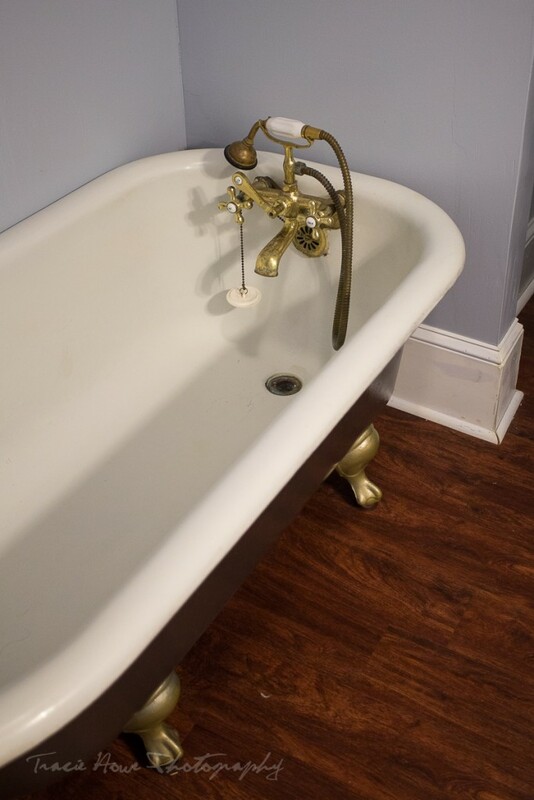 We also had access to the common area of the house where we could shower (although our suite had a cool claw footed tub), make coffee, and hang out with our new best friend Presley, the host’s endearing pug. 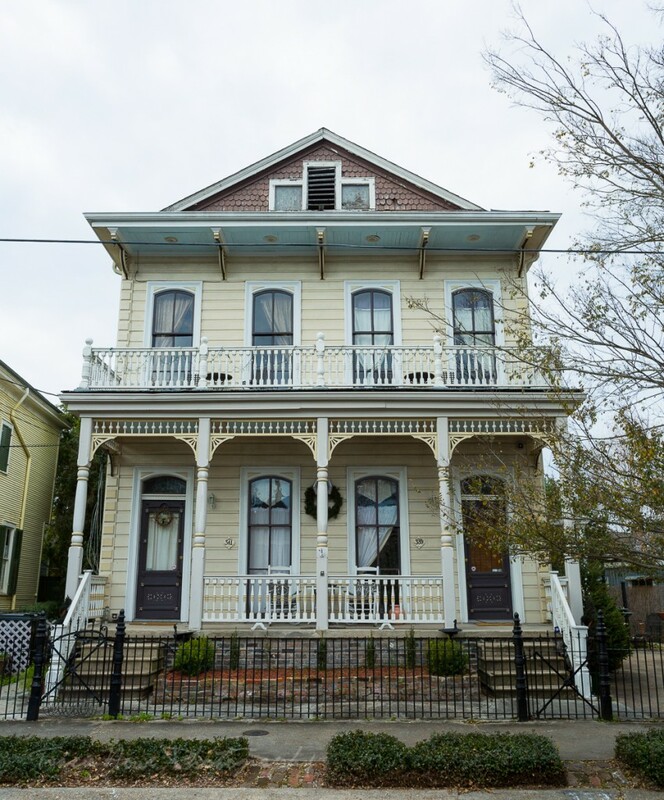 Our Airbnb rental, The Old Captain’s House, a beautiful historic Victorian manor in the heart of Algiers Point. Shortly after arriving in Algiers Point, we walked a few blocks to The Dry Dock Cafe, a quaint looking place on the corner just across from the ferry terminal. Upon receiving our menus I was delighted at the plethora of southern food I saw listed! Having grown up in Virginia, I’ve missed hushpuppies and catfish, which are both hard to find in WA. Not only did they have southern food, but seafood, my other love! I knew to expect these types of food in Louisiana, but I didn’t know I would find it all so soon. I decided to have a creamy crawfish pasta since I don’t remember ever having eaten crawfish before. I figured I should start out right and eat a dish with local ingredients. I told the charming waitress where we were from and that I didn’t think I’d had crawfish before. The Crawfish Marinica was deliciously rich and I think Dave was envious of my choice. 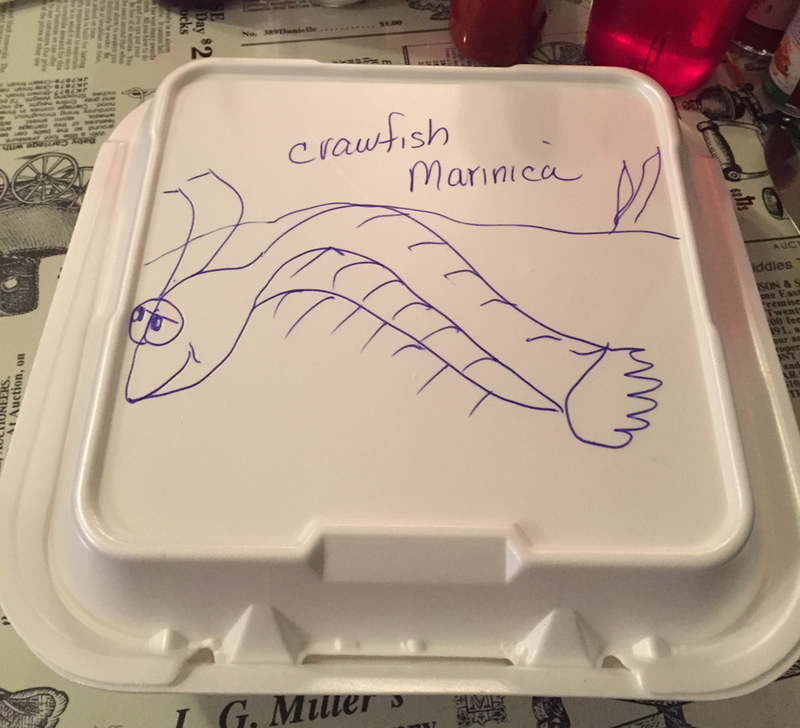 At the end I got my leftovers in a container that our waitress had drawn a crawfish on, so I “would know what a crawfish looked like”. How sweet is that?! The next day we ate breakfast at Tout de Suite Cafe, the bustling coffee shop just two doors down. It seemed to be a destination for many regulars and visitors to Algiers Point, and for good reason. The interior was slightly rustic in that old building kind of way, softly lit by a large front window, making for a very cozy atmosphere. The food was home made, organic, and delicious! We went there many times during our trip for breakfast and lunch, but our favorite visit was on a weekend morning when a local Jazz band was playing. That really completed the idyllic picture of this quaint neighborhood cafe. 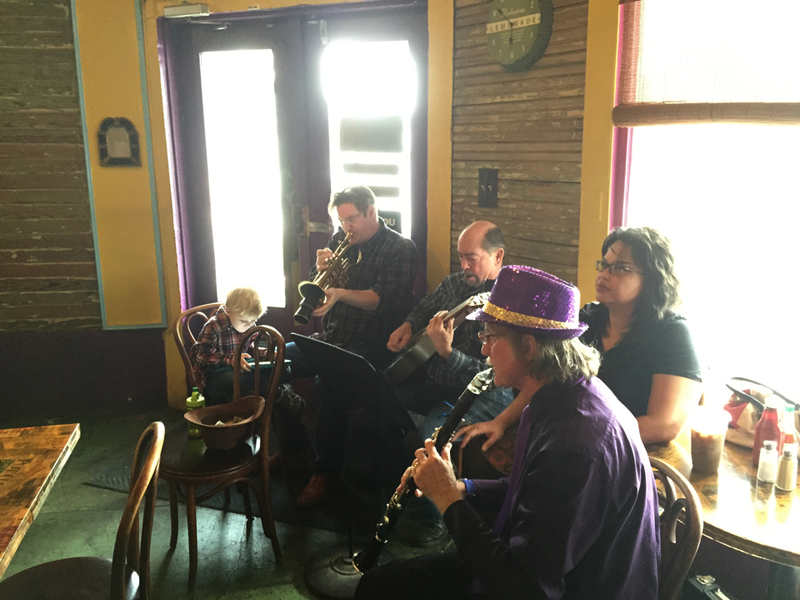 A phone snap of the live band entertaining us during a lazy weekend breakfast at Tout de Suite Cafe. While we spent much of our time in Algiers Point, we did venture out into the downtown of New Orleans. It was pretty easy for us to get there without a car. Just a few minutes of walking got us to the pedestrian ferry. It was $2 for the ten minute trip across the river, just steps away from all that we wanted to see in New Orleans. The pretty riverfront was right there at the ferry terminal and a mall was just to the left as we left the terminal. Parks, restaurants, shops, and public transportation were all within a five minute walk at most. The French Quarter was very close as well, and we probably spent most of our time there while in the city. On the rare occasion that we were out in the city after the last ferry left for Algiers Point, we still had options for getting back. We took the bus once, although I would recommend skipping this option. It wasn’t very efficient and the buses for Algiers Point only seemed to come every couple of hours. Whether this was our fault for being uninformed or not (despite the handy app we had downloaded), we opted for an affordable taxi the next time we missed the last ferry. However, I think that the ferry was really the best way. Kind of a novel experience too, seeing the view of the city from across the river and sailing right up to it. I think just staying in Algiers Point was an unexpected highlight of our trip. We found ourselves sleeping in and slowing down to a pace that seemed to resonate more with the neighborhood than with the city. And while we enjoyed our time visiting the French Quarter and it’s surrounding tourist packed areas, Algiers Point was more our speed and we would both choose to stay there again on another visit to New Orleans. 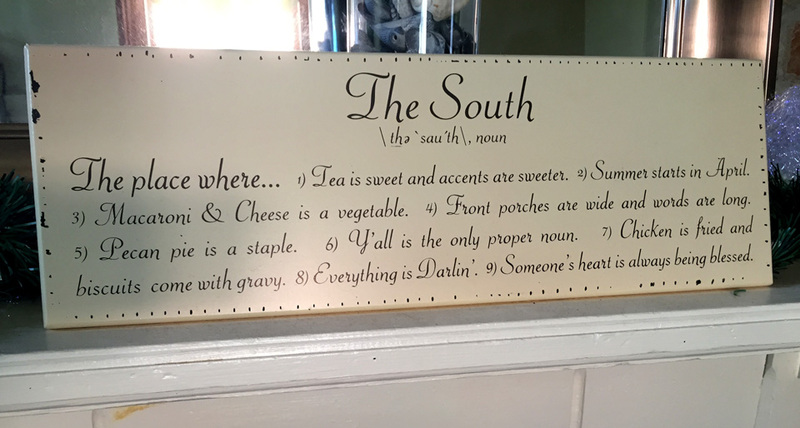 A perfect description of the South, prominently displayed in the common room at our Airbnb rental. Should you decide to stay in Algiers during your visit to New Orleans, just be sure to know the ferry schedule. It worked best for us to simply show up and wait for a ferry, rather than trying to time it exactly. Schedules can get a little off, but what’s the rush? Also, make sure you have some cash on hand. The terminals have change machines if you need them. Unless you plan to drive somewhere out of the city, don’t worry about having a car. There are plenty of other ways to get around. Finally, look up the Old Captain’s House on Airbnb and tell them Tracie sent you! You won’t be disappointed! Natalie Deduck - Great Choice Tracie! You got the whole package = good room, charming house and a sweet dog! Sounds like you had an amazing trip! donna - That charming waitress who drew the cute crawfish is a lovely friend of mine. Who actually just wrote a book. A shrimp called PeeWee and moved there from ct. Check out her book.it is a good read.